The ominous weather forecast was poor all week: potential lightning and storms on Saturday morning. And the day before the race, the Wayfarer Half organizers caved: they called off the Wayfarer's Half Marathon. 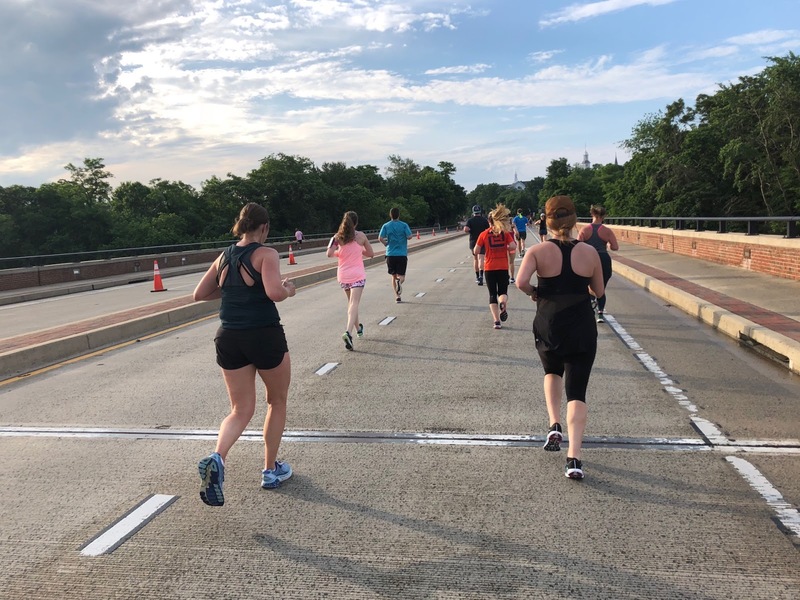 What they did not cancel was the Wayfarer's 10k, set to start at the same time but expected to finish before the storms hit. 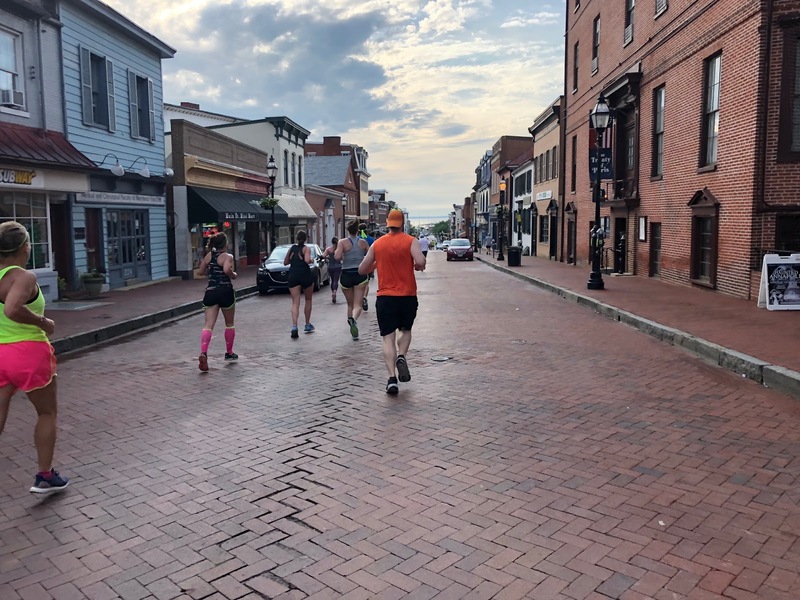 All half marathoners were automatically transferred to the 10k, and while deferment was offered, the halfers who ran the 10k were promised a 50% off code for the next year's race. Race buddy Sarah and I debated our options and, while we were disappointed in the slashed mileage, we ultimately decided to take our chances on the 10k. 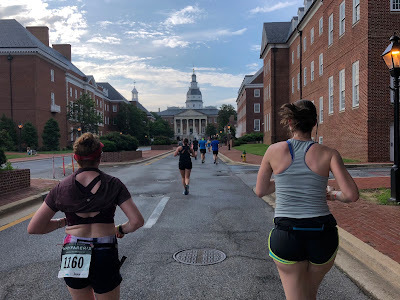 And so we arrived to the Navy-Marine Corps Memorial Stadium in Annapolis in the early hours of the morning, one on the weather predictions and the other on the course ahead. The race began with little fanfare, and before we knew it we were off on the 10k course. This caused me to get a little cocky to start - after all, I had prepared for a half marathon and, met with scarcely more than six miles, why bother holding back? So my first mile was rather quicker than it should've been, but probably not as fast as it could've been, as for the first half mile or so the course was pretty packed. There was no corral system in place, self-seeded or otherwise, and people weren't respected the underwritten fast-in-front-slow-in-back rule. Indeed, at the onset of the race I had to dodge around a pair of walkers running side by side. Blarg! Luckily after a bit of snaking and ducking I was able to break out into a clearer area. After a brief stint on some fringe roads, we found ourselves in historic downtown Annapolis - always a highlight. For some reason I get a kick out of running down the same streets and past the same bars and restaurants I've seen and eaten in before. Our next landmark from there was St. John's College, after which we passed the entrance to the US Naval Academy and headed back toward the stadium. 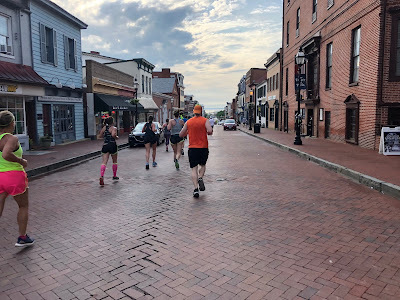 The final stretch was basically identical to the Zooma Half, which leads me to believe that had the Wayfarer's Half gone on as planned the course would've been at the very least nearly the same. Hey, at least that saved us some hill work - while the 10k did feature some inclines it wasn't at all what I'd call hilly. Course support was pretty solid. I don't recall a ton of spectators, but there were plenty of volunteers handing out water and Gatorade at decently spaced intervals. As for my personal performance, I wound up having a darned good race. My too-fast opening miles precluded me from those coveted negative splits, but I didn't drop off as much as I could've and ultimately wound up with a PR of over 2.5 minutes. I guess that's what happens when you actually taper for a "mere" 10k! I don't envy the Wayfarer's organizers their decision to cancel the half. I can only imagine it's rough to try and keep everyone safe in the face of the always-fickle weather report, especially in a race's very first year. Their offer of discounts and deferments was sporting; I'm sure the fine print at registration didn't require they make any concessions at all. Have you every found yourself unexpectedly in a different race than you expected?